Did you know vinegar is actually healthy for you? One table spoon of apple cider vinegar 15 minutes before lunch and dinner helps you loose that weight. It actually burns it and it burns it fast because it liquid. I read that they have the pills for it too, but the liquid state works faster. For the first week I will take one spoon before lunch and dinner, and the second week I will take 2 spoons, and the third week I'll take 3 spoons and continue like that. I read that some people lost 20 pounds (around 10kg) within a couple of months. Well, I hope I get accomplish that :) I read it's also got for diabetics. Also, another thing I heard from a couple of my friends is that parsley water (maydanoz suyu in Turkish) is extremely healthy beacuse it's really high in vitamin C!! MORE than oranges! I had a meeting at 17:30 and after it was done, I headed to the market. 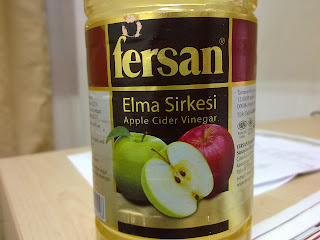 I found the apple cider vinegar and got 1 litre (5TL or 1KD) and I also got the parsley. I kinda of felt stupid because I didn't know which one it was! There were so many green leaves, I couldn't tell the difference. All you have to do is boil some water (I boiled it in the kettle) and wash the parsley and put it in a pot. 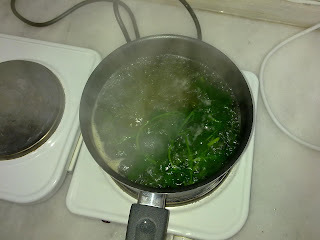 Then, put the boiled water in the pot with the parsley and let that boil for about 5 minutes and you're done! I just had a glass of it, and it's not half bad! Give it a try. I also got some lemons for just in case, I minght squeeze some drops in water. I'm really proud of my commitment, but lets just hope that it's not a "phase" I'm going through and that I really do stick to this till the end. Of course, I'll be able to succeed by your support!